Before I left on vacation I visited my local library to pick up some ‘summer beach reads’. Naturally, as an academic geek and hockey fan I left the library with Adam Proteau’s Fighting the Good Fight: Why on-ice violence is killing hockey and Sheema Khan’s Of Hockey and Hijab: Reflections of a Canadian Muslim Woman (I don’t know how much hockey is in this one but the hockey sticks on the cover were enough to sell me). The review of Khan’s book will have to wait for now but for anyone wanting to learn more about the arguments for and against hockey fighting Proteau’s book is an easy read with some interesting perspectives from players, coaches and other hockey personnel. For those of you unfamiliar with Adam Proteau’s stance on hockey fighting he refers to fighting in the book as a “dancing bear show”. He believes that fighting takes away from the excellence of the sport and that the NHL has severely failed as far as player safety is concerned. Throughout the book he highlights how the culture of hockey has changed from using one’s body to separate a player from the puck to separating a player’s body from their head. He backs up his statements with solid suspension and injury facts and from testimonials from hockey insiders such as long-time NHL referee Kerry Fraser and players Mathieu Schneider and Georges Laraque. I think perhaps the most compelling part of Proteau’s argument for banning hockey fighting comes from the fact that he was a goon during his hockey days. Proteau was your quintessential hockey enforcer, a solid defenceman who also stuck up for his teammates. Then one day during his Single ‘A’ career he used his stick like an axe on a defenceless opponent who was lying face up on the ice. Proteau got in about four good hacks before the referee could subdue him and from then on he was dubbed ‘Hacksaw Proteau’. It was this incident and the ensuing suspension that caused him to reflect on the culture of hockey. He found it difficult to reconcile the admiration he felt from his teammates for his behaviour with the boos from the parents in the stands. The league informed him that if he ever committed such an act again he would be permanently banished from the league. So when the next season rolled in and he was put in a position to fight or not he chose the latter because he didn’t want to be banished from the league. But Proteau’s decision to abstain from fighting brought cheering from the parents in the stands while his teammates, as he writes, “couldn’t conceal a primal sense of dismay that one of the bigger bullies/policemen/revenge artists on the team had effectively been neutered” (p.84). Additionally, I think that Fighting the Good Fight does a really good job of outlining the poor governance on the part of the NHL where player safety is concerned. By using the “fighting is needed to police the game” argument the NHL merely demonstrates that it has no control of its players and prefers to leave the game as a Colosseum fight where anything goes. However, when Proteau writes of player safety he’s not just talking about fighting he’s also talking about head shots and a lack of facial protection (e.g. cages/visors). Proteau argues that in the interest of business, let alone human safety, losing ten percent of your money makers to concussions every season (from a variety of injuries) is a poor business model. Why doesn’t the NHL try to protect its assets? Is it because they feel that every player is replaceable? I don’t watch NFL football but while reading this book I learned that the NFL seems to care a heck of a lot more about its players than the NHL. A sport where most player’s jobs are to do nothing more than hit the other guy has made great strides to protect all of their players and particularly their quarterbacks because they understand that superstars drive revenue and that you need parents who are willing to put their kids into your sport for long-term sustainability. Lastly, I’ll touch on some of the concussion information included in the book. Mathieu Schneider explained that some of his former teammates would still have difficulty showering two years after receiving a concussion because the water pressure hitting their head was too painful. Ian Laperrière continues to complain of vision problems with indoor lighting after being hit in the face with a puck. Add these issues on top of memory loss, headaches, nausea and life after hockey looks pretty grim when you leave the game at the ripe old age of 35? 40? Maybe 25? I have always figured that my future children would play hockey, whether they wanted to or not – KIDDING! But after gaining more insight into the amount of concussions that children receive participating in minor hockey and the lasting effects of these concussions it almost seems like a no brainer to keep my children out of the game that I love to play. And if the NHL doesn’t smarten up soon there won’t be much of a talent pool left to select from because all of its prospects will be on field or court instead of on the ice. 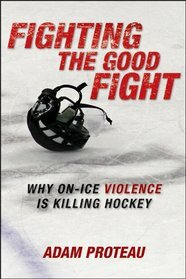 Overall, I think Fighting the Good Fight is an interesting read for any hockey fan whether you are for or against hockey fighting because the other issues concerning player safety are also pertinent. My only complaint of the book is that, as I have argued in a previous post concerning concussions, the arguments of fighting, headshots, and visors all become intertwined. Considering his book is about on ice violence the issue of visors and puck/stick injuries is kind of a tangent all by itself. Moreover, I think the issue of headshots versus fighting are pretty separate issues. People who deliver headshots (e.g. Matt Cooke) aren’t necessarily the fighters; therefore, we are addressing two different groups of players who both make the game unnecessarily dangerous. Perhaps, addressing player safety would be a more accurate subtitle but that doesn’t sound nearly as controversial, does it. Good review, Courtney! I really enjoyed this book and thought it does a great job of explaining arguments against hockey violence in an accessible manner. My only major critique is that I feel that Proteau starts to get into the way hockey masculinity shapes/includes violent behaviour and then shies away from developing that analysis. But overall it’s a fantastic read with lots of great insight. Open-minded hockey fans will delight in this book, if not agree with every single argument, e.g. the Instigator rule. Those who cling to “the code,” at best a flawed protectorate of “player safety,” will say that they want to ensure the cheap shot artists don’t ruin the game and that the banning of fighting will make things worse. Proteau’s book is not about “banning” fighting, per se; rather, it’s about the culture of hate and violence. It’s not Proteau ranting without supporting evidence. He interviews others to bolster his position. One thing not addressed in the book, something I would like to see in a follow-up book or article: fans and our role in the supply-demand chain. If The NHL, NHLPA and fans want to avoid brain injuries, the whole culture of hate an on-ice justice must be addressed, not just the fighting. To continue the evolution of our wonderful game, can’t we be more creative in regard to the questions we ask and how justice is administered? How about questions other than, “Are you for or against fighting?” Why not allow players to arrive at a consensus via an online poll where a mix of closed-ended and open-ended questions are posed—a place like playerspoll.ca? Thanks for hockeyinsociety.com and keep up the great work!